Although you won’t draw a fashion design from the back every day, you’ll use the back view occasionally. A woman’s back in fashion illustration is quite beautiful, with sleek lines and shoulder blades that look like angel wings. Outrageous dresses for women with barely there backs, including wedding gowns, cry out for a back view. And a guy’s broad back looks hot when he’s sporting board shorts. Drawing the back isn’t all that different from drawing the front — they both start with the basic trapezoids and the arm and leg holes. Draw two trapezoids just like you do for the front view and add the back of the neck as a reference. Draw “angel wing” curves to show the back shoulder blades. Add arcs for the arms and the upward arcs for the cheeks of the derrière. The imaginary center front line — or in this case, the center back — passes through the derrière cheeks. Sketch in a head and arms, too, if you’d like. For attitude, draw the trapezoids at two different angles, remembering to lengthen the shoulder blade on the side that leans closer to the ground because the arm extends in that direction. 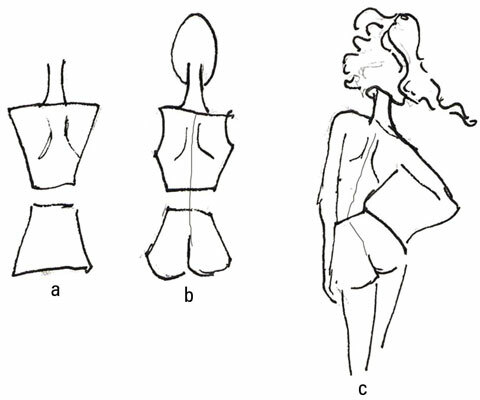 The figure shows a finished sketch of a figure with her shoulders angled. 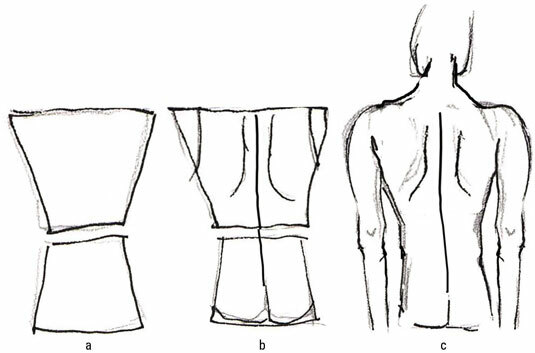 A guy’s back is broad and trim, at least in fashion illustration. It tapers to the waist, whether you’re drawing a surfer or just a really hot shirtless dude. Draw two trapezoids, keeping the waist wide and the shoulders broad. Add in longer angel wings that extend about two-thirds of the way down the upper trapezoid. Draw arcs for the arms and small arcs for the buttocks. Finish with broad shoulders and a wide neck.